There was a tempest of biblical proportions on the evening of the opening night. We drove past countless broken tree branches, flooded roads and downed electrical wiring to arrive at a soggy Riverside Theatre. And so - when it rained on stage – the thought crossed my mind that it might not be a theatrical effect, but the real heavens opening. If only the storm outside was as gentle and refreshing. I have seen almost all the Packemin Productions’ musicals since it was founded in 2011, and I think this was the company’s best one yet. It was a complete package of technical and performance excellence. 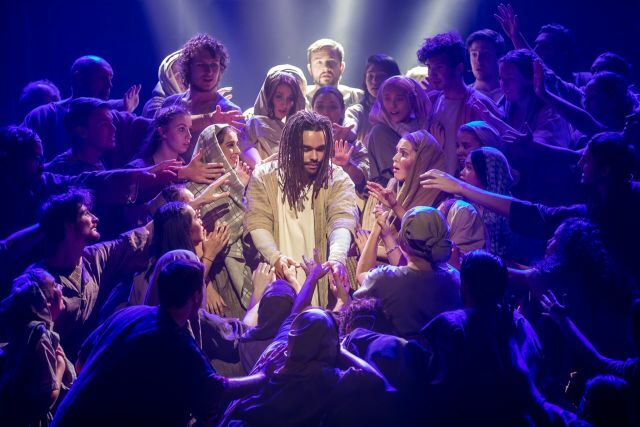 Director Neil Gooding follows closely Tim Rice’s intention that Jesus Christ Superstar is the Gospel according to Judas. It is wayward disciple’s perspective on the last days of Jesus. The musical begins and ends on him – even though it is slightly odd that Judas rises from the dead (but apparently that is in the script). 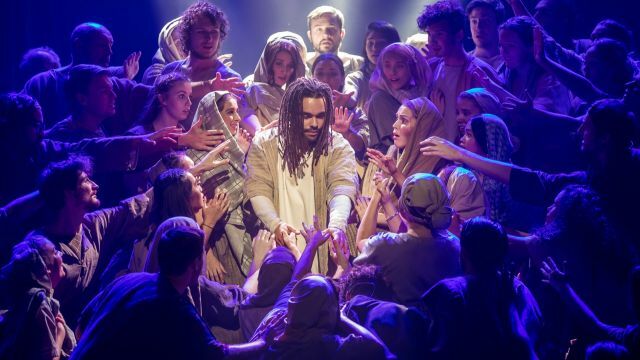 As Judas, Toby Francis was in fine singing form – soaring brilliantly to high falsetto notes. Overall the sound quality and band were crystal clear – devoid of any trace of opening night crackles. The second male lead is Jesus (Joe Kalou). For the first twenty minutes or so of the musical we don’t hear much from him, spending much of this time waving to his adoring disciples. He looked every inch a superstar – particularly when stripped down for a Roman whipping. Did all Rabbis at the time look this good? Other principals were also strong; Brittanie Shipway was sweet as Mary, Gavin Brightwell commanding as Pilate and Haji Myrteza had an outstanding booming voice as Caiaphas. There was also a touch of pantomime in Herod’s big dance number, with the chorus allowed some leeway for a bit of Razza Matazz. It was a striking looking production. The stage was framed by multi-level scaffolding. The lighting design by Sean Clarke was big and juicy. Heavenly rays of white and red pierced the stage with perfect timing. A few tricks, including water turning into wine, a dove flying across the stage and a frightening looking (but safe) hanging added to the spectacle. Outside of a full multi-million dollar pro production you wouldn’t find a better realised performance of this rock opera.